I recently ran into a friend who was excited to inform me, that he had seen an all black squirrel playing with a pair of grey squirrels in a wooded lot in Springs. He had never seen anything like it before and wondered if I knew any information about the species. Meanwhile, another friend texted me a photo of a brown and white patched deer and asked if I knew where the animal might have come from. Both of these folks were surprised when I told them that both the squirrel and deer were the same squirrel and deer they had always known about. The difference was simply a color issue that they hadn’t been familiar with. 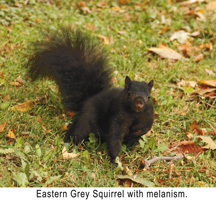 The black squirrel was in fact an Eastern Grey Squirrel with melanism, and the deer a white tailed buck with a form of leucism called piebaldism. So, what are all these “isms”, and how do they relate to an animal’s color? Let’s begin with pigments. Many biological structures, like skin, feathers, fur, hair, even eyes contain pigments in special cells. In many animals, including amphibians, reptiles, fish, crustaceans and cephalopods, these are called called chromatophores. Some species have the amazing ability to quickly move pigments and adjust reflective plates within these chromatophores, changing their color almost as if by magic. Octopus and Cuttlefish are masters at this color changing control and camouflage. Chameleons have a similar ability however, the causes may be activated by changes in mood, temperature, even stress levels. Plants and flowers also have biological pigments. Chlorophyll is the primary pigment in plants which is important to the photosynthesis process of absorbing certain energy from light while reflecting others. It actually absorbs yellow and blue waves of light, while reflecting green. Carotenoids is another principle pigment in plants and the most common type of pigment found in nature. In mammals and birds, the special cells that contain pigments are called melanocytes. Pigments in many animals serve a purpose of protection, by camouflage, mimicry, or simply by creating a colorful warning. However, it is the skin pigment melanin that I’d like to discuss in this piece. Melanin pigments determine the color of an animal’s skin, hair, feathers, fur and scales which protects tissues from UV radiation and sunburn. These pigment cells cannot be manipulated like the chromatophores of an octopus but, during initial development these genetic cells can mutate and cause unusual color conditions / diseases. Although many animals have pigments other than melanin, the majority of mammals have melanin as their only pigment. The melanin pigment is responsible for two color ranges; one produces dark browns and blacks, while the other creates light reddish tans and blondes. 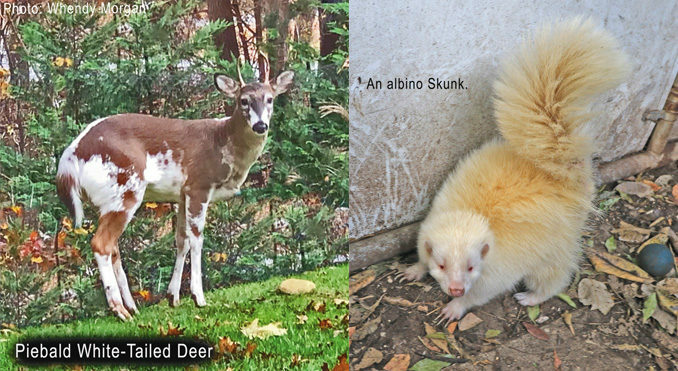 It’s the delicate balance of melanin production that gives many mammals their natural color. When melanin cells are produced excessively during an animal’s development, due to genetic mutation, their skin, coat or plumage color will become darker, or in many cases turn black entirely. This was the case in my friends discovery of the black squirrel in Springs. Had my friend visited Olney, Illinois, he would have experienced the complete opposite. After all, Olney is the “White Squirrel Capitol of the World”. This brings us to the opposite mutation effect from a lack of, or complete absence of the melanin pigment. This is referred to as Amelanism, and are most commonly recognized in three forms; leucism, piebaldism, and albanism. Leucism is the partial loss of pigmentation due to the lack of various pigment types, not just melanin. In leucism, the eyes and lips remain their normal color while the animals skin, hair, fur, feathers and / or scales appear lighter colored, or in most cases completely white. If all pigment cells fail to develop the entire skin or coat will be white in color however, if only certain groups of pigment cells are defective, only white patches will develop on the skin or coat. This is often referred to as pied, piebald effect or piebaldism. “Pie”, meaning multi-colored and “bald”, referring to skin. Ironically, this is where the majestic Bald Eagle gets its name from. The sharp contrast in color of an adult eagle’s white head and tail-feathers to its dark-colored body, gave the bird a piebald or “Bald” appearance, hence the moniker. Locally, we are sometimes lucky enough to see a piebald white tailed deer. I personally find them absolutely beautiful. Vitiligo is a human form of piebaldism also known as leukoderma, caused by the same loss of melanin. The final form of Amelanism I wish to discuss is also the most commonly recognized by name and appearance yet, is actually rare and most often confused with leucism. It’s called albanism. Perhaps it is more commonly recognized because it’s a disease that can affect humans, where melanism does not. Albanism is most common in birds, reptiles and amphibians and not as much in mammals. Roughly 1 in 1,800 bird births will result in albanism, while 1 in 10,000 will occur in mammal births. Unlike leucism that can lack various pigment cell types, albanism lacks only the melanin pigment. This creates two other prominent differences from leucism, The first is that albanism cannot be partial or create only patches of color deformities. It affects the entire body. The second and most obvious difference is albanism affects the eyes, where leucism does not. With albanism, pigment cell loss affects both the retinal wall and the iris of the eye, creating a more translucent eyeball structure. This allows the underlying blood vessels to show through, making the eyes appear pink or reddish. 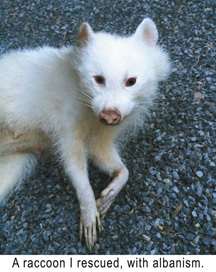 If the eyes are not pink the animal is not albino, but rather leucistic (leucism). 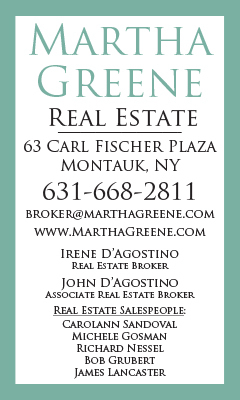 There are a number of other color issues in regards to our vast animal kingdom. Genetic mutations in pigment cells that cause deficiencies in normal pigments or excessive productions in others, creates other unusual appearances. You also have invertebrates like jellyfish, or the glass octopus that are translucent or have other illuminating capabilities. In short, nature and wildlife is beautiful, colorful and above all necessary.